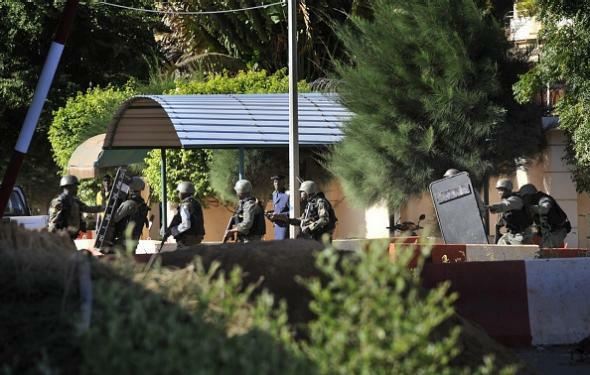 Mali: Hostages taken at Bamako Radisson Hotel, up to 27 dead. Troops outside the Radisson hotel in Bamako, Mali, on Nov. 20, 2015. Update, 2:10 p.m.: Per the New York Times, all surviving hostages at the hotel have been freed, but as many as 27 victims may have been killed in total. Two attackers are reportedly dead and authorities are searching the hotel for others. Update, 10:35 a.m.: The France24 network is reporting that at least 15 people have died at the Radisson in Bamako. Hollande happens to have mentioned French counterterrorism activities in Mali in a public statement Thursday; in 2013 and 2014 French forces helped retake areas in the country’s north that had been seized by al Qaida–allied Islamic militants. Reuters says that the gunmen who attacked the Radisson shouted “Allahu Akbar” as they stormed the hotel and that some guests who were able to recite verses of the Koran were allowed to go free.